Will the road ahead be easy for the new Jeep Compass? Jeep launched its much hyped Compass SUV in India on July 31st, 2017. The Compass, a small SUV focused on developing markets, was a long time coming in India. However, with a price range of Rs. 14.95 lakh - 20.65 lakh, Jeep shook up the whole industry. Such pricing has been made possible thanks to about 65 per cent localization of the SUV's components. This makes the Compass live in a territory of its own. However, considering the extended price bracket, the baby Jeep will compete with certain vehicles - some similar, while others slightly different. Let’s have a look at what else can be yours for around the same price bracket of the Jeep Compass. 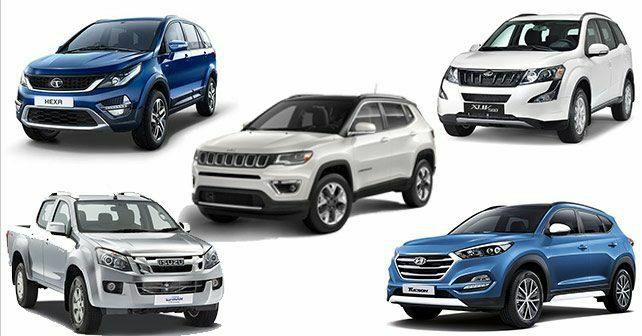 Granted, this people mover shares little with the Jeep when it comes to direct competition - but what cannot be overlooked is the fact that the second generation Innova is absolutely the best selling vehicle of the Rs 14 lakh - 20 lakh price range. Based on a standard rear-wheel-drive body on frame setup, the Innova is positioned as a premium family hauler. It doesn’t get off-road abilities like the Jeep, but it gives a lot of flexibility when it comes to engine and transmission options - one petrol and two diesel engines, with petrol and bigger diesel getting an auto gearbox. Plus, the Toyota Innova brand name has earned a solid goodwill for itself over the past decade - which ensures low depreciation values. Hyundai’s Tucson, is possibly the most direct rival to the Jeep Compass in India. However, the Hyundai is at a major disadvantage here because it is just assembled in India - not locally manufactured. Therefore, it commands approximately Rs. 3 lakh (variant-wise) more over the Compass. However, working in Hyundai’s favour are its slightly larger dimensions, and available automatic gearbox option for the diesel version. The Tucson was launched in India in mid-2016, and since then, has been managing decent (if not great) monthly sale figures for Hyundai. Tata Motor’s flagship SUV aims to take up the dual role - a tough SUV, as well as a family hauler. It comes with a supremely torquey powertrain and a generous level of equipment. Hexa’s interior quality is the best seen on any Tata yet, and can truly compete with many vehicles from international automakers. While a petrol engine is not on offer - the diesel can be had with an automatic transmission. Tata also offers Hexa with an AWD system - which may not be as capable as a proper 4x4, but is perfect for occasional light off-roading. Mahindra’s trusted workhorse - the XUV500, continues to march strongly despite of being 6 years into existence. The XUV, just like the Jeep and the Hyundai, is based on a monocoque chassis setup. This car’s forte has always been its generous levels of equipment, and its durable 2.2-litre diesel motor. You can also have this with an automatic gearbox. The XUV has gone onto to become quite the favourite buy for aspirational SUV buyers. But considering the new Jeep’s tempting price tag, the XUV buyer may look the Compass way now. Don’t expect Mahindra’s traditional body-on-frame SUV - the Scorpio, to be in the same league as the others here. So why include it on this list? Simple - the Scorpio is one of the few cars that comes with a proper four-wheel drive system with its low ratio box, just like the Jeep. And it is actually quite capable off-road. So, it can lock horns with the Compass when the tarmac ends - and for a lot less money. Ok, this may sound completely off. But, the lifestyle pick-up segment in India is next to non-existent, and so, the V-Cross gets the liberty to sneak into many SUV comparisons. For less than Rs. 13 lakh, the V-Cross gets you true 4x4 abilities, coupled with a unique look - the reason why it has been able to find so many homes. And while Isuzu may be a new name in India, their SUVs globally are very well reputed for their durability. So, the V-Cross makes for a though, cool looking, and a durable alternative to your average SUV. Then again, the Jeep will be more opulent than this tough Japanese.